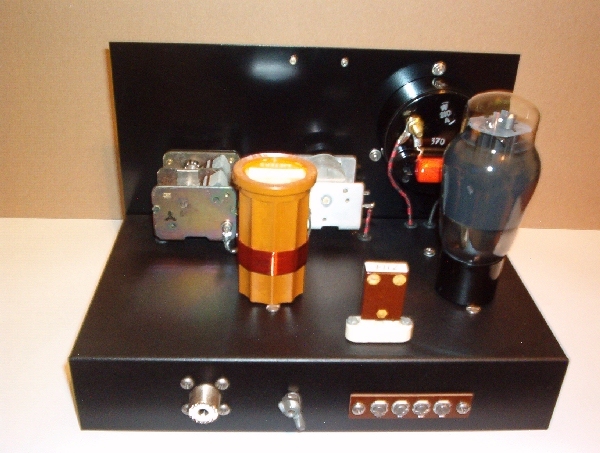 The 6L6 oscillator was one of the most popular transmitters ever built. Many hams started the hobby with a homebrewed 6L6 rig. 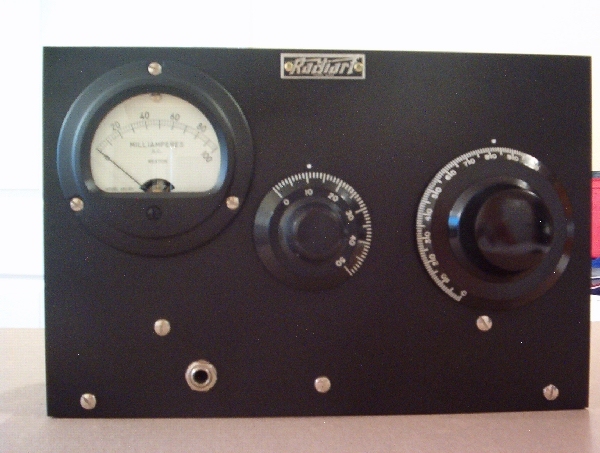 There were many versions of the transmitter and most worked well. The circuit I used is very simple and the results are a very clean stable tone. Harmonics are not a problem with the Pi network output. The circuit came from a February 1994 issue of QST. The steel chassis is 6 X 10 inches and made by Hammond. The front panel is 1/16 inch sheet metal. With the exception of capacitors, resistors and chokes, all parts are from my junk box. The layout was simple. I took the parts I had and simply made them fit with the shortest leads possible. I used the 6L6G because they are big and look great. Newer versions will certainly work fine. This circuit also works well with the 6V6 tubes, although output will be less. If you use a 6L6 tube, use a 0-100 ma. D.C. meter. If using a 6V6 tube, you can get by with a 0-50 ma. D.C. meter. My transmitter runs at 60 ma. 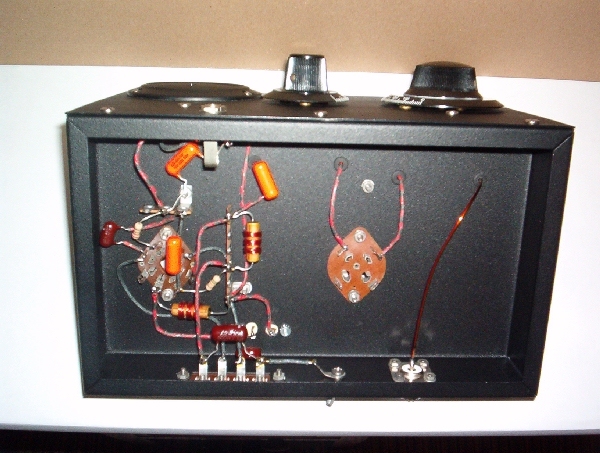 A 6V6 tube is typically 30-35 ma. I use FT-243 crystals and have had no problems. The variable capacitors came from junked broadcast sets and work well for lower voltage transmitters. Most are around 365 pf. which will allow tuning into most antennas. The 4 pin plug in coil forms are 1.5 inches diameter made by Hammarland. I used 20 ga. enamel covered wire close wound. 16 turns for 40 meters and 34 turns for 80 meters. If your coil form is a little smaller or larger, just add or subtract a turn, this is not super critical. Do not touch this coil transmitting! You will get shocked and get a RF burn. Power supply requirements are simple. The 6L6 or 6V6 tube needs 6.3 VAC for the filament. A well filtered 150 to 350 volt D.C. power supply will work for plate voltage. I suggest at least a 100 ma rating. The voltages can be LETHAL. Do Not build or operate the transmitter unless you fully understand this. If you not are sure of something, seek qualified help. Tune up is simple. If you are using a wattmeter, simply tune for maximum wattage and the best signal on your receiver and listen for the best tone. Note: Maximum wattage does not always give you the best tone. Turn the RF gain down on your receiver and listen for the best tone. 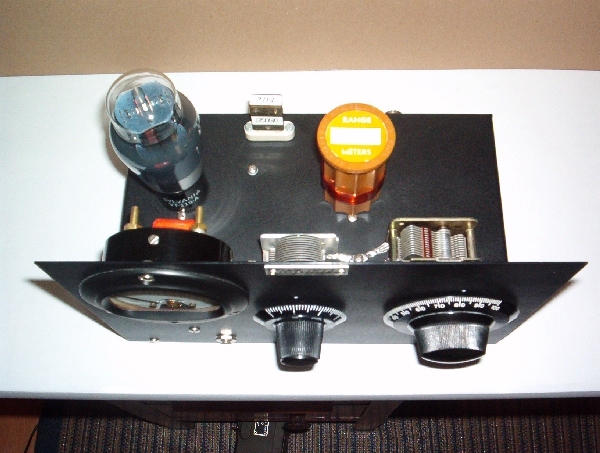 If you don't have a wattmeter you can use the dip and load method, which is my preference. Plate current is dipped on the meter with C1 and then increase the load with C2. Do this several times until you have the output and tone you want. Be sure to only key down for a few seconds at a time. Multiplying your plate voltage times your milliamp meter reading will give you the input wattage. The output wattage is approximately one half of the input wattage.